From the Dottie Rambo Elvis Presley Collection. Elvis Presley gave this hand inscribed and signed leather bible to his close friend, singer-songwriter Dottie Rambo on an evening in 1974 when the Rambo's and other friends were visiting Elvis in Las Vegas. 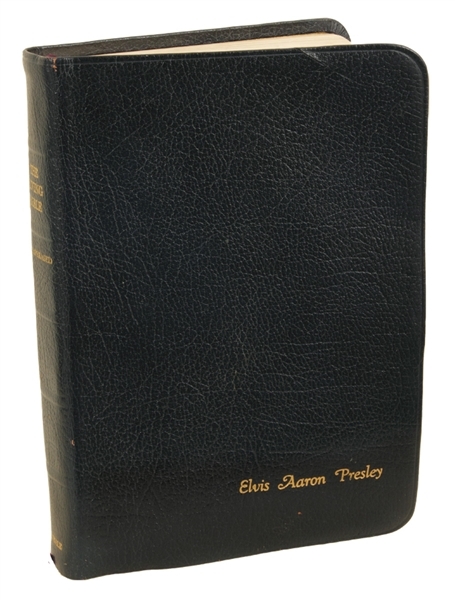 Elvis' name "Elvis Aaron Presley" is embossed on the cover and he has handwritten and signed the left side of an inner page, "Dottie, you are special, love you forever, love Elvis Presley" in black ballpoint pen. Dottie and Elvis were very good friends, and Elvis recorded some of her songs. 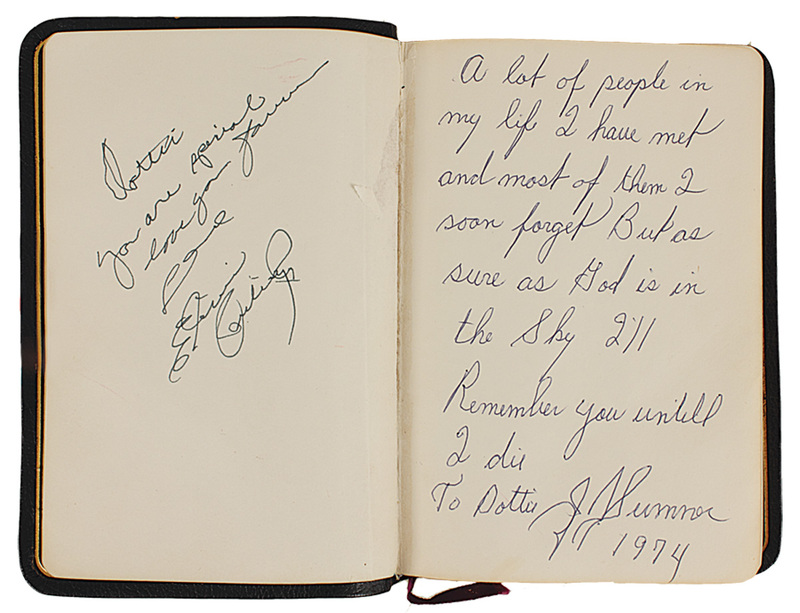 Although the handwriting and signature look irregular, it is positively Elvis' writing. He was most likely writing it quickly, leaning the book on his leg and perhaps even inebriated. This bible was treasured by Dottie for many years and she kept it in a secure location, close to her, for the rest of her life. The night when Elvis gave the bible to Dottie, she was worried about his health, and in an effort to distract her he offered to buy her a car, saying, "Name it! I'll give you anything!" She told him she'd like to have it bible and he gave it to her. Elvis and Dottie's friend J.D. Summer , who was also there that night, has signed and inscribed the opposite page. Measures 5 x 1 x 7.25 Very good condition. The bible comes with a letter of provenance from Dottie's family and a Comes with a Gotta Have Rock & Roll™ Certificate of Authenticity..